All Purpose Marking Paint – Aervoe Industries, Inc.
An economical marking paint that is packaged in a can that may only be operated in an upside down position. 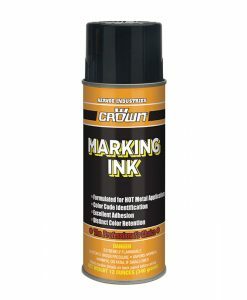 It is designed to provide a cost-effective marking wherever needed. Markings from regular paint colors will last up to 2 months. Fluorescent colors fade faster, depending on traffic and exposure. Benefits: Aervoe’s All Purpose Marking Paint is economically priced and provides good visibility in the 30-day range depending on traffic and exposure. It meets standards set by OSHA and APWA/ONE Call Systems. It is not affected by moisture or water and it will not wash away once dry. Can be used with the cap on in Aervoe applicators #244/245. The spray-through cap eliminates accidental discharge. Each can is non-clogging and empties completely.